Cuckoo's on each hour the number of hours. Battery Operated Cuckoo Clock with electric eye is silent when their is no light (off at night). The 12 Tunes are: Happy Wanderer, Edelweiss, Lara's Theme, Swan Lake, Lorelei, Sounds of Silence, Clementine, The Entertainer, Fur Elise, & 3 German Folk Tunes! This is a beautiful and lovingly crafted piece, with great carvings of a thicket of leaves surrounding this charming cuckoo. This quartz clock plays 12 tunes, one every hour. After the synthesized cuckoo call, the music plays and the dancers twirl. 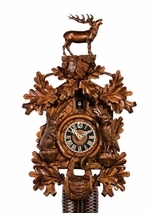 This cuckoo clock is by Rombach und Haas exclusive. Click here for more pictures: 1 2 3 4.